Under each key is a mechanism with four gold plated key contact wires that act as switches to complete the circuit between the tone generators and the drawbars when the key is played. Figure 1, at left, shows a diagram of the key contacts when the key is at rest, or not depressed. Four individual signals from the tone generators enter from the right side of the diagram (through the green dots). 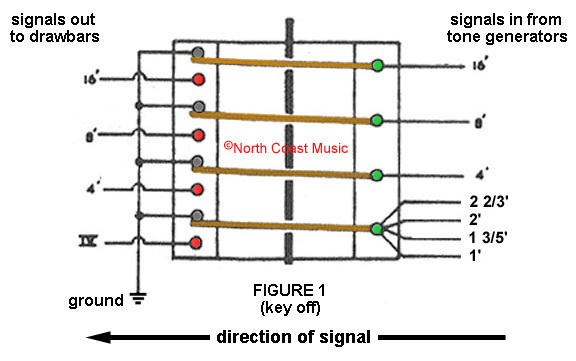 These four signals flow through the gold plated wire key contacts. These key contacts pass through a mechanical "contact ram" (the vertical black line in the cener of the illustration). 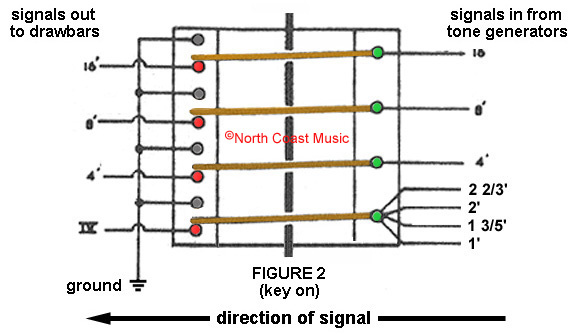 Note that the left side of each of the four key contacts is resting against the gray contact, which is connected to ground, essentially shorting out the signal from the tone generator. In this position, the key is turned off. Figure 2 shows the result of depressing the key. The "contact ram" has been pushed downward by the depressed key. The four key contacts have now dropped away from the grounded position and now complete the circuit to the four red contacts. This action has the connected the output of the tone generators to the 16', 8', 4' and IV rank signals to the drawbar circuitry described in the next web page. The key is "on" in this position. As you see, there are four individual key contact wires under each key on the single Continental Organ. As each single Continental Organ has 49 keys, that means that a total of 196 key contacts must be in correct operating order to allow the proper operation of the organ. Here is a photo of the top side of a key contact "ram." It is the tan rectangular device pointing up from the lid of the gray painted key contact box just under the wooden keys. This contact ram slides up and down through a slotted hole in the lid of the contact box. 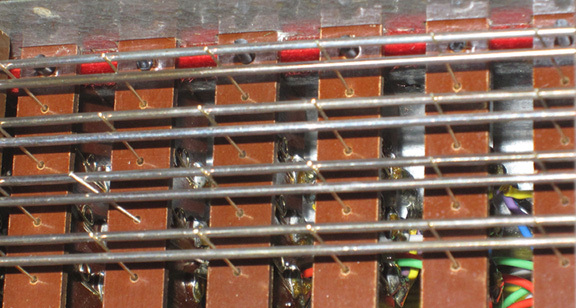 Below the lid of the contact box, and out of view in this photo, four key contact wires pass through each of the 49 contact rams. 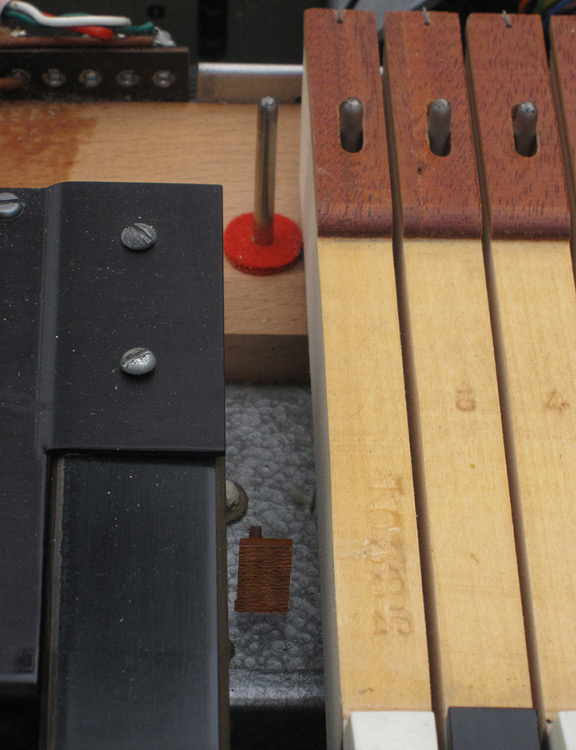 As the wooden key is depressed, the key contact ram and the four key contacts for that note are pushed downward. This action moves the key contact wires from the "at rest" position, against the grounded buss bar, to the "hot" buss bar, turning the key "on." Here are six of the 49 key contact rams, pictured from inside the key contact box. The eight silver horizontal wires are called "buss bars." These buss bars are arranged into four pairs. Between these four pairs of buss bars are the gold plated key contact wires. 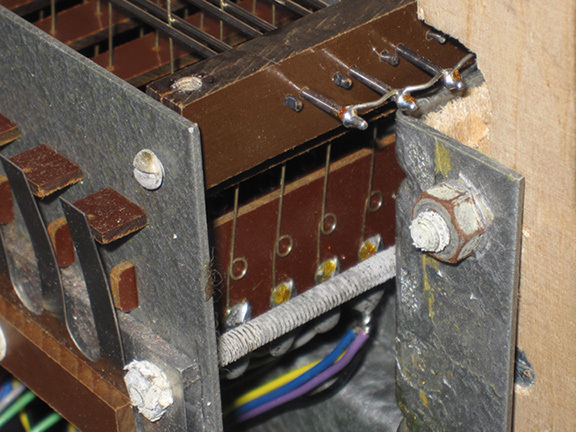 The upper buss bar in each pair is grounded, and the key contact wire rests against the grounded buss bar when the key is not being played. When the key is depressed, the key contact ram pushes the key contact wire to the lower, or "hot" buss bar, turning the key on. This is an end view of the key contact box, showing the four key contact wires for the high "C" on the organ. The steel "comb" springs shown on the left side of the picture push upward on the key contact ram, firmly returning the key contacts to the off position when a key is not being played. It is possible that over time, any one of these 196 key contacts may break, causing a part of a tone on that key to dissappear. North Coast Music sells replacement gold plated key contact wires for the Continental Organ, but I recommend that you have these installed by a professional organ service tech. This is a difficult repair, out of the reach of most non trained technicians.